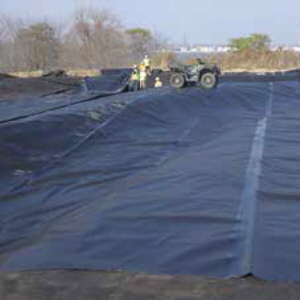 GeoSkrim® N45BT2 is a textured flexible geomembrane, reinforced with a closely knit 9x9 weft inserted polyester scrim fully encapsulated between two layers of highly UV stabilized lineal low density polyethylene. Exceptional toughness, high tensile and puncture strength is achieved with the combination of premium high strength LLDPE and dense scrim reinforcement. A highly stabilized formulation consisting of antioxidants, UV stabilizers and carbon black provide excellent protection for long-term exposed or barrier applications. GeoSkrim® N45BT2 contains a cast texture surface produced with our exclusive GeoGrip™ technology. The GeoGrip™ texture is made up of durable random spikes and diamond shaped bidirectional bars for unmatched uniform stabilization and support. GeoSkrim® NT-Series geomembranes are produced in the color black as standard, and are available in other custom manufactured colors with minimum order quantity requirements. Click here for Product Data Sheet.